Probably the most important concept in the whole realm of astronomy is that of the nebula; for it was only when the idea of the nebula as the original material of planetary evolution was advanced, that astronomy could be put upon a really scientific basis. Until the actual genesis of solar systems and planets could be accounted for in some measure, astronomy was merely descriptive. The credit for stating the nebular hypothesis goes to Kant and Laplace, who, however, based their speculations upon the law of gravity only. Since that day the nebular hypothesis has undergone many modifications, as actual observation of the heavens through telescopes and later through photographic means, to say nothing of our general knowledge of physics, has progressed. The latest modification of the theory of how other celestial bodies are derived from nebula is the one proposed in this book. That the reader may understand both the original theory and the chain of logic and observation by which this new theory grows out of it, we shall briefly summarize the older ideas, giving the scientific authorities for them, and showing how these authorities have gradually worked to a point, without knowing it, of course, where our theory and ours alone, fits all their facts and draws them together in a consistent explanation of what is actually happening in the heavens as the stars form and go through their immensely long life-cycles. how these authorities have gradually worked to a point, without knowing it, of course, where our theory and ours alone, fits all their facts and draws them together in a consistent explanation of what is actually happening in the heavens as the stars form and go through their immensely long life-cycles. THE MILKY WAY AND ANDROMEDA But the reader will first wish to get a very general idea of the field we are to discuss in this chapter. Probably to most people the word nebula conveys an idea almost as hazy as the Milky Way to the naked eye. In fact many people think that the Milky Way is a nebula and let it go at that. Others think that nebula are merely clusters of very distant stars--such as we do see in the Milky Way. But as a matter of fact there is only one nebula in the whole sky that can be seen without the aid of a telescope, and that is the so-called "Great Nebula in Andromeda". Of this nebula, George F. Chambers, in his little book, "The Story of the Stars," says: "There is one elliptic nebula which stands out beyond all the rest, yet its great size, brilliancy, and peculiar features forbid its being regarded as a typical elliptic nebula. I am here alluding to the 'Great Nebula in Andromeda,' Messier's 31st. Its ellipticity is considerable; it is likewise very long, and has a bright central condensation which renders it readily discoverable by the naked eye on a clear night." Of course, with the naked eye we cannot see any details, but with the telescope this nebula is found to have a well defined structure, and all other nebulæ are found to have certain structural characteristics in common, the nearer ones giving every evidence, as we shall see later on, that they are not clusters of stars at all that idea having been absolutely exploded. ARE NEBULAE STELLAR OR GASEOUS? We need to accentuate that last point because it is still overlooked in many of the more popular books. Thus in Mr. Chamber's book just referred to, the author begins his chapter on nebulæ by saying that "many or most are probably stellar in their constitution, though some of them, however, may be not such but gaseous." As a matter of fact a few of the early discoveries of glowing masses in the sky were thought to be nebula but later research has shown them to be extremely distant star-clusters, so far away that only the highest power telescopes would resolve them, some so far away that we cannot resolve them at all into their constituent stars. Then how, asks the reader, can you tell that all nebula are not stars? The answer is, by the spectroscope. Later on in this chapter we shall see astronomers referring to this instrument and its discoveries more than once--in fact on it depends our whole theory in a way, for if the nebulæ were really stars our theory would fall to the ground. So a word here may not be amiss. The spectroscope is simply a prism with a sort of small telescope at one side of it, through which is led, by suitable means, the light from any object from a candle flame to a star. At the other side is a barrel containing other lenses which act more as a microscope and magnify and define the ray of light which has been led into the prism. Now a ray of white light is split up by the prism into the seven colors of the rainbow, and the light of a candle flame is split up in- to its constituents. Also when any chemical substance is burned and the incandescence from it's burning is analysed in this way, we can read by the colors of the broken up light just what elements are present in the chemical substance. In this way we can identify the elements in the sun and in other burning or incandescent heavenly bodies. And the light from bodies like the stars gives one sort of "spectrum," as the colored band of broken light in the prism is named. And the light from nebulæ gives an altogether different sort of effect, due to the presence of luminous gasses. Thus the spectroscope has proven absolutely that the nebula is not made up of stars. As Simon Newcomb summarizes the matter in his "Popular Astronomy," Laplace observed that the planets moved around the sun--of our solar system--in the same direction in which the sun rotates on its axis, and in the same plane. Laplace explained this uniformity of motion by assuming that once the atmosphere of the sun had occupied all the space now occupied by the planets of the solar system. From mechanical laws he knew that the sum total of rotary motion must at all times be the same in the same system. In the beginning, therefore, he assumed, the sun with its immense fiery atmosphere had a slow rotation upon its axis. The mass, being extremely hot, would cool off and as it did so would contract toward the center. But as it contracted its velocity of rotation would increase--that is a fundamental law of physics--so that at a certain time the mass would be whirling so rapidly that the centrifugal force due to the rotation--the force, that is, that causes a weight whirled at the end of a string to fly away when one releases the string--would counterbalance the attractive force of the central mass. Then those outer portions would be left as a ring, rotating around the center, while the inner portions would continue to contract until in their turn their velocity caused them to stay on a circular course of their own, forming an inner ring. In this way a succession of rings would be formed, revolving around the common center in the same direction. Soon, however, these rings would begin to cool off, and as their denser materials would cool sooner than the others and begin to condense; then the denser parts would attract the less dense parts, by gravitation, and at last we should have a single solid mass surrounded by vapor, revolving around the sun at the same distance and in the same plane in which the ring had revolved from which it was derived. Laplace thus accounted for the evolution of a whole solar system from a nebula, and in the same way he accounted for the formation of the satellites that surround the planets in some cases as the planets surround the sun. In the case of the planet Saturn, he observed that the gas of the rings was so uniform in density that none of it had cooled in advance of the rest, and so the ring has remained as we see it today through our telescopes. But there were weak places in Laplace's hypothesis. If we turn to Professor Forest Ray Moulton's "An Introduction to Astronomy", page 454, we shall find these objections summarized. The author, in collaboration with Chamberlin in 1900, studied the problem from actual observations tested by the principles of dynamics, and found a number of phenomena that contradicted the hypothesis. We need not enter into all of these, but one or two of them are very important from our standpoint. For instance, if a ring were formed as Laplace supposed, "it would be so widely extended that the mutual gravitation of its parts would be very feeble, and according to the kinetic theory of gases"--which describes how their particles repel one another and states the laws governing that repulsion--"the lighter elements would escape. But the lightest known element, hydrogen, is abundant on the earth, though it is now in chemical combination with other elements". It is also very doubtful, according to Moulton, whether the rings would condense into masses in the way Laplace assumes. And Moulton further thinks that the theory is rendered quite untenable by the fact that the amount of rotation which the whole nebula originally had, and which in its present evolved form it still ought to have (according to the law of the conservation of energy) is only one two-hundredth of what it ought to be. So Mouton dismisses the Laplacean hypothesis and then goes on to discuss its successor, Chamberlin's Planetesimal hypothesis or Spiral hypothesis, in which it is assumed that the solar system is evolved from a spiral nebula. But before going into that, let us see what the nebula are actually like when studied by telescope and telescopic photograph. Let us see what a spiral nebula is and what other forms beside the spiral they take. One of the best general descriptions of the various forms of nebulæ will be found in "Curiosities of the Sky" by Garrett P. Serviss, chapter VI. In 1899, Garrett tells us, Professor Keeler discovered, by photographing them, that the majority of nebula were not only glowing masses of gaseous matter, but had definite forms. They were, for the most part, spiral with a central nucleus, and while there are other forms of nebula, the "ring" and the "planetary," it is a question, says Serviss, whether every nebula has not at least a tendency to be spiral. But at least, Serviss says the ring and planetary nebulæ serve, insofar as they exist at all, to support Laplace's theory, while the spiral nebula apparently play into the hands of Professor Chamberlin and his planetesimal hypothesis. DO THE NEBULAE POINT TO A NEW THEORY? If now we approach the nebula with mere detailed examination, can we see anything common to all forms of nebula, something which might lead to a theory which is neither that of Laplace nor of Chamberlin. To answer this question let us turn to a very detailed description of the nebula, that of the great English astronomer, Sir Robert Ball, given in his wonderfully illustrated volume, "A Popular Guide to the Heavens". Here is his description, accompanied by a plate, of "The Spiral Nebula in Canes Venatici". "This, the most famous of the Spiral Nebula, had its true character first recognized by Lord Rosse with his great reflector at Parsonstown in Ireland. We are so happily situated with respect to it that we get a fair view of it, and can trace in considerable detail how its branches are interlaced and studded with condensations which look as if they are on the way to become stars. Recent photographic work has shown that a large proportion of the nebula, both known and hitherto unknown, are spirals, and this form must now be considered almost the rule instead of the exception". Our only observation here would be that the condensed portions are certainly not destined to become stars or planets but that they are destined to become central suns of planets. ". . . And in this, as in many nebula, we find black holes with edges surprisingly sharp which are very hard to explain, except upon the highly speculative assumption that they represent dark material structures of some kind interposed between us and the shining nebula." The observation there, is a most interesting one. Its explanation may be rendered unnecessary by our own further consideration of the matter. But here is Professor Ball's most interesting description, that of "The Ring Nebula in Lyra": "The central star which is so conspicuous in the photograph, is barely visible in the largest telescopes. It is much brighter photographically than visibly, probably because its light is composed chiefly of those rays of short wave length to which the plate is sensitive but the eye nearly insensitive. "The photograph shows quite plainly that the ring is not uniformly bright; there are even some indications that it is composed of several interlacing or overlapping rings, and it is remarkable how the ring thins out at the ends of its longest diameter. 'With longer exposures the center of the ring fills up, and the nebula becomes a disc. It follows that the ring-like appearance is in a sense deceptive; that the real shape of the nebula is something like a hollow shell of gas. Of which the border looks brighter, perhaps, because one is then looking through a greater depth of the shining matter; but this is at best a conjecture." "It is a striking illustration of the power of photography in depicting nebula, that it has brought out a distinct resemblance between the Dumb-Bell in Vulpecula and the Ring in Lyra which could hardly have been suspected from the visual appearance of these objects. If we imagine the nebulosity, which exists inside the ring, to shine a little more brightly, so that it fills up the Ring, and at the same time imagine the tendency towards thinning out at the ends of the longest diameter to be a little more pronounced, we shall see how easily the ring might be transformed into the Dumb-Bell. Both are gaseous and both have a central star. It is difficult to resist the conclusion that the two nebula are closely related in kind." What does that mean but that the nebulæ are evolving toward a certain form? Toward a form that is roughly suggested by the last described nebula with its spherical skin broken at two opposite poles and its central star, or, why not call it its central sun? "All the nebula except the spirals have bright-line spectra instead of dark-line spectra like those of the sun and stars. This shows, in accordance with the principle of spectrum analysis, that the nebulas are masses of incandescent gas rather than luminous solids or liquids shining through cooler gases. Be-fore these results were obtained by the spectroscope it was supposed that perhaps the nebula were other galaxies of stars so far away that their individual members were not separately visible. The spectroscope, however, proves they are gaseous and this conclusion is in harmony with other considerations regarding the evolution of suns." -- Descriptive Astronomy . "The distinction between annular and planetary nebulæ has been to a great extent abolished by the use of improved optical appliances. Each kind seems to be made up of three essential parts: a faintly shining disc--or globe projected into a disc--a ring-like condensation near its outer margin, and a central nucleus presenting the appearance of a star. The last feature is often seen only with extreme difficulty, but there is reason to believe that it always exists. Mr. Burnham, who has measured a large number of these objects with the 36-inch Lick, for the purpose of providing a standard of comparison for the determination of their possible future movements, goes so far as to suggest that the presence of a central star should be regarded as the criterion of classification for planetary nebulæ." "A strikingly similar object is situated in the constellation Andromeda. Imperfectly seen at first as a uniform, greenish blue disc, an interior vacuity detected at Parsonstown betrayed its true nature to be rather annular than simply planetary. Nor is the ring it includes by any means symmetrically shaped. Lassell considered it to be bi-annular. Professor Vogel was impressed with the warped and twisted aspect of what may conceivably prove to be a multiple combination of rings thrown off in various planes. Closely wound spiral branches, and a central star were observed with the Ross reflector. "The photographic study of these two nebula/ lately set on foot by Dr. Schemer at Potsdam, may be expected to add much and rapidly to our knowledge of their nature and conformation. The images obtained of them, although only half a millemetre in diameter, show a considerable amount of detail. They confirm the annular shape attributed to them on the warrant of telescopic observations, and bring out, with singular strength the central nuclei which the best telescopes have not always availed to display. In the photographs these are, nevertheless, the brightest parts of each conformation. Yet they are mere irregular condensations with no pretentions to a stellar nature. The superiority of their actinic power repeats the phenomenon first brought into notice by photographs of the Lyra nebula, and seems to point to a general law. Dr. Schemer thinks it can only be accounted for by supposing a predominant quantity of some peculiar gas emitting, in the main a highly refrangible light, to be collected in the central regions of planetary nebulæ, yet the resulting nuclei, when they can be seen at all, shine with a white light, bear a star-like aspect, and probably give continuous spectra. The problem of their real constitution is thus far from easy to solve. But whatever the secret of their photographic effectiveness, it is already tolerably evident that they, play a part of fundamental importance in primary seats of the forces by which these interesting objects are moulded into characteristic shapes . . ". There is something prophetic about the last sentence quoted. Coming as it does after the remarks upon the light emitting powers of the nuclei--a suggestion, it will be noticed, that they may be small suns, certainly lurks in those remarks about the action of the nucleus on the camera plate--coming after those remarks, that last sentence, although its author does not seem to recognize it, plainly hints at the planetary and annular nebula as systems in which a central sun not only illuminates but controls (the "primary seats of the forces," etc.) the outer rings or discs--that is, holds them by gravity. But before pursuing this further we may as well obtain more evidence--for there is plenty of it. Miss Clerke, in an article in the Scientific American Supplement , Vol. LVIII, page 24122, remarks that in all planetary nebulæ the nuclear star "appears to act as the pivot of the surrounding vaporous structure." But she admits that "the question, however, is still open as to the real nature of the connection between the planetaries and their central star." She mentions a theory that the central star is "fed" by the outer nebula, but she admits that there are not enough facts to back it up. She discusses the centripetal tendency which would cause the central star in every case gradually to attract and incorporate the larger outside shell, but she reminds us that repulsive forces are active in such systems as well as concentrative ones, and she admits that as far as orthodox astronomy is concerned the riddles of nebula formation are not solved. It is interesting to note that the central star, although its observation has been made much more detailed by photographic methods, was clearly seen by the earliest investigators. According to Professor C. A. Chant, writing in the Scientific American Supplement, Vol. LXXV, page 88, Simon Marius made the first of such observations in 1612, two years after Galileo had invented the telescope. Marius' description of the nebular nucleus is very suggestive; he compares it to "the flame of a candle seen through a transparent horn." Many years later Hershel observing this same nebula--it is the Great Nebula in the Constellation of Andromeda--notices that the central point "though very much brighter than the rest, is decidedly not a star." Russell Sullivan, writing in the Scientific American Supplement , Vol. LXXIX, page 287, on the planetary nebulæ, remarks that their number is very small compared with the spirals, the known ones being counted by the score, while it has been calculated that there are over 500,000 nebulæ in the heavens as we know them. He notes that there is "often" a central star or haze,--really always, as we have seen--so that the nebula is not, as Herschell had supposed, a mere hollow sphere. It is, however, hollow, often presenting an elliptical appearance. "Fifty of these nebulæ have been studied Photographically with the Crosly reflector, using different lengths of exposure in order to bring out the structural details of the bright central portions as well as of the fainter, outlying parts. Most planetary nebulæ show a more or less regular ring or shell structure generally with a central star." A paper by Messrs. Campbel and More presented at the same meeting gave the results of a search made with a spectrograph and the Lick 36-inch telescope for rotation effects in 33 planetary nebulæ. Definite evidence of rotation was found in 16 and suspected in five others. There it will be seen are evidences of all the phenomena which we claim are associated with the beginnings of planets, a separation of the nebulous mass into a central star or sun and an outer envelope whose inner walls are probably repelled in some degree at least by the light from the central star--as light has been proved to exert a small but definite pressure--and the rotation of the whole affair which causes it to take the form which later condenses into the planets as we know them. It may also be noted here that in planetary nebula a greenish color is always noticeable showing that condensation has preceded further than the purely incandescent stage. But the orthodox astronomer pays less attention to the shell-like nebula than he does to the spiral, and as we have seen, Chamberlin would derive the evolution of our solar system from a spiral nebula. Professor T. J. J. See writes about this in the Scientific American Supplement , Vol. LXIII, page 26,008. He points out that we have no proof as yet that the nebula do form stars or systems of stars. (Our sun is a star; the earth is not) He says that speculation on the spiral nebula has gone wild and that it is time to call a halt. "There is not the slightest probability that our solar system was ever part of a spiral nebula, and such a suggestion is simply misleading and mischievous. The great circularity of the planetary orbits shows the absurdity of such a hypothesis, and this leading characteristic of our system as bearing on its mode of origin was carefully considered by Leplace more than a century ago. "At present we must frankly admit that the nature of the spiral nebula is quite unknown. And while we cannot be sure that nebulæ develop into stars we may justly hold that the stars are outgrowths of gravitational condensation of matter which was once dark." In other words, whatever spiral nebula developed into, according to See they do not develop into stars or suns. We doubt, he says, "whether the forms of the nebulæ can be expected to disclose the processes of stellar evolution." But there is certainly evolution going on in them. If it be not the evolution of suns or stars, may it not be the evolution of planets? But if the reader wishes more detailed criticism of the idea so opposed by See, let him turn to Garrett P. Serviss'"Curiosities of the Sky". Mr. Serviss points out that it is much easier to criticize Laplace's theory of nebular evolution than it is to replace it. He pictures the great whirling nebula observed by Lord Rosse with its striking "appearance of violent whirling motion," and its apparent tearing up by centrifugal force--which is apparent only, as further observation shows that the masses apart from the center are not being hurled off but have definite orbits. There is there, says Serviss, no confirmation of the Laplacean hypothesis, but, he asks, "What hypothesis will fit the facts?" Let us endeavor to answer him. The foregoing observations may have seemed to the reader who is unacquainted with astronomy to be tedious and to lead nowhither. But they have been necessary and we will now proceed to draw the threads together. What have we really discovered? We have discovered, in the first place that there are large gaseous bodies in the sky with glowing nuclei and shell- like or spiral outer boundaries, and that in some way planets come from these. But neither Laplace's theory or Chamberlin's theory of how this evolution comes about fits the facts. We have read admissions from more than one astronomer that the facts they observe cannot be fitted into any coherent theory of planetary evolution. We have adduced abundant evidence from the best sources that any one force, centrifugal or otherwise, cannot account for what we see. Now what is it that we actually do see? 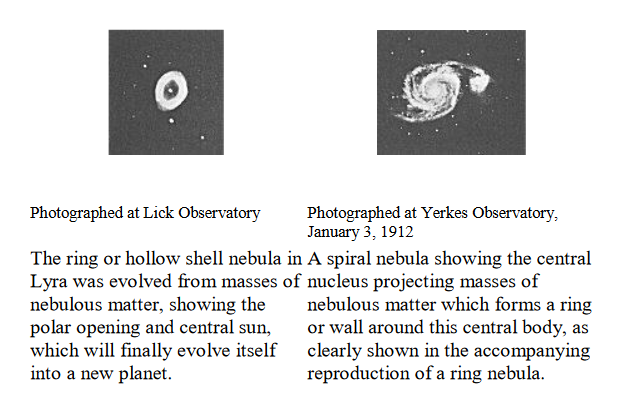 In the first place a very large number of spiral nebular; in the second place a much smaller number of nebulæ which look either annular or planetary shaped to the eye, but which Sir Robert Ball tells us, in the quotation given before, are related and tend to have a shell-like circumference and always have a central nucleus which is not a star. We remember also the quotation from the Scientific American in which Dr. Heber Curtis told the Astronomical Society of the Pacific that recent observations of planetary nebulæ showed them to have a shell-like structure and a central nucleus. Now there is no way of telling by looking at these nebulæ which are the oldest, the spirals or the shells. To tell that, we have to make an inference, but it is a very obvious one. Evolution is always from the relatively unorganized and chaotic to the relatively organized and orderly. Obviously, if there is any evolution at all, it must be from the wildly whirling, chaotic spiral nebulæ to the shell form with its relatively stable exterior and its nucleus within. In other words the spiral nebula is the first stage; the shell-like nebula is the second. What is the third? The usual answer is: a solar system. But Moulton has shown the impossibility of this in his criticism of the Laplacean theory. The reader will remember that, among other things, he argued that all the lighter elements such as hydrogen would fly off first and be present only in the outer planets of the so-evolved solar system, while we know that that has not been the case in our own--there is hydrogen on earth and even in the sun. And Chamberlin's theory on the other hand can only successfully deal with the spiral nebulæ; it ignores the evolution of the spiral into a shell-like nebula; to say nothing of the fact that Serviss in the book already referred to in this chapter, criticised that theory in a number of details. The Laplacean theory, he says, is infinitely simpler, "and with proper modifications could probably be made more consonant with existing facts in our solar system than that which is offered to replace it. Even as an explanation of the spiral nebulæ, not as solar systems in process of formation, but as the birth-places of stellar clusters, the Planetesimal Hypothesis would be open to many objections. Granting its assumptions, it has undoubtedly a strong mathematical framework, but the trouble is not with the mathematics but with the assumptions. . . . . . "
But supposing the final stage in the evolution of a nebula is not a sun or a solar system but a single planet? We should then be able to explain the evolution of the nebula satisfactorily but we should have to revise our notion of the structure of the typical planet. But that is precisely what we are willing to do, because we have all sorts of evidence, in varying fields, that the actual structure of the earth, Mars, and Venus,--and hence, we may assume of every planet throughout the stellar universe, is just what we should expect from the period of their evolution that is open to our discovery in the observation of the nebulæ. In short, we hold that the shell-like structure so well described by Sir Robert Ball, grows more and more definite as the nebula cools, until it solidifies. We hold that the central sun which holds it by gravitational contraction in its spherical circumference also cools and contracts but keeps its relative position. And we further hold that the black apertures which Ball also describes (and pictures) as characterizing the Dumb-bell Nebula are typical of the two openings which are always left when the nebula cools into a planet. Owing to the fact that the planets are not spherical but are oblate spheroids, that is to say having their greatest circumference at the equator, and owing, too, to such force-factors as the varying centrifugal force due to the unequal sphericity of the orb and the oscillation of the outer envelope around its axis, the two polar openings which are so distinctly shown in the Dumb-bell nebula are gradually formed. If the reader refer to any book on astronomy preferably Ball's--which contains a picture of this nebula he will readily see how this occurs. The nebula is so called because the two larger polar openings form two scooped-out spaces in what would otherwise be a spherical, or more exactly spheroidal body. Imagine an apple with two very large bites taken out of opposite sides, the center of each bite being one end of a diameter, and you have a very clear representation of this particular nebula. But why, the reader may ask, should this particular shaping take place rather than any other. Why should this whirling motion and differentiation of parts end in the formation of planets with two polar openings, one at each terminus of the axis of rotation? The answer is simple. We know that the earth is not a spherical body but an oblate spheroid, that is to say it is a body whose equatorial diameter is greater than its polar diameter; in other words, the polar axis is shorter--the poles are flattened. This is the case in all planets we can observe with the telescope. That it would naturally be the case follows from the nature of the centrifugal force. If a spindle is revolved very rapidly, and water thrown upon it, the water is hurled away again, in a direction away from the spindle, at right angles to its axis of rotation. Now, in the case of the nebula that became the earth--or we can substitute the case of any other planet--we have the force of gravity holding the whole envelope of the nebula in a clustered mass around the central nucleus; we have the centrifugal force throwing it off in an envelope and always tending to throw off the outer portions of it away from its axis of rotation and more toward the equator than toward the poles--for that is the direction in which the centrifugal force acts--so that the equatorial diameter would be established as soon as the centrifugal force and the gravitational force balanced, and the attraction of the greater mass of the envelope for the very thin part of the envelope at the poles would cause the opening gradually to define itself. As soon as the very thin vapor at the actual poles was attracted a little toward the equator it would come within the play of the centrifugal force and would then also be pushed out a little so that the lips of the polar opening would gradually be defined, as indeed, in the Dumb-bell nebula we see them gradually getting defined. Then, as the mass liquefied and ultimately hardened, the inner sun would also have shrunk, and the light that once shone through the outer envelope would now be illuminating its inner side and only escaping through the polar openings. And from that point the evolution of the surface of the planet goes on in the way that has so often been described, with constant upheavals at first, with the separation of land and water after the planet has cooled to the point where water can form, and who can doubt that some similar sort of evolution has gone on in the inside and hidden portion of the planet? The reader who is astonished at the idea of such an evolution as this must remember that in the succeeding pages we shall give detailed proofs from the observations of such near planets as Mars, Mercury and Venus, and from explorations of the earth itself to support this theory. But before considering the planets let us here consider another body met with in the heavens-- the comet. Our theory explains the comet, and the comet agrees with the other celestial bodies in illustrating our theory. A comet is a body, coming from outer space across our skies, with a relatively small solid or fused head, and with an enormous gaseous tail streaming behind. Whether some travel in orbits which are not closed curves and so will never bring them back to our sky--or whether they do have extremely eccentric but closed orbits is a mooted question. Many of them, however, do return, but it is known that when the comet approaches the head contracts and a nucleus is clearly seen, a nucleus which alone is solid or fused while all the rest of the comet is gaseous. The mystery of the comet lies in its tail. Serviss quotes Herschell as declaring that a profound secret lay there. But if we suppose that the nucleus of a comet is the same as the nucleus of a planet, does it not follow that the tail of exceedingly imponderable and scattered matter is the remains of what had once been an outer shell. In other words a comet is a planet which has died. Either through coming into the orbit of some immensely greater planet or into that of a sun, it has been torn from its own orbit, brought into an area of contending forces, possibly even has collided with another planet, had its outer shell broken up and sublimated by the great heat into the most tenuous sort of a gas which trails after the nucleus which was once central but which now heads the strange celestial procession of matter that we call a comet. How closely this view fits may be seen from Moulton's "Descriptive Astronomy" in which he tells us that while the head with its "small bright nucleus" measures from ten thousand to a million miles and the tail may stream away 100,000,000 miles, the actual nucleus itself only measures a few hundred miles in diameter, varying "in an irregular fashion". But that is precisely what we should expect if the nucleus had once been an interior sun, for a few hundred miles or to the most a few thousand would be just the dimensions which we should expect the interior suns to have varying, of course, with the size of the planets. And here is still more remarkable testimony. Hector MacPherson tells us in his book, "The Romance of Modern Astronomy" that the great comet of 1811, with a tail stretching for a hundred million miles behind and fifteen million miles in breadth, had a nucleus that according to measurements by Herschell was only 428 miles in diameter. 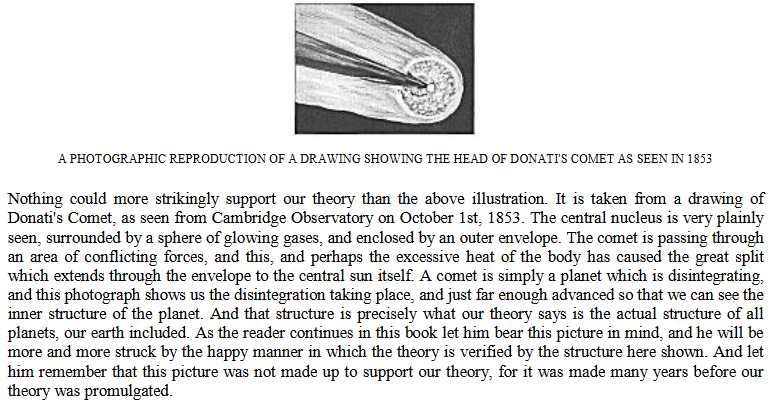 The comet of Donati, detected from a Florence observatory in 1858, had a nucleus which "shone with a brilliance equal to that of the Polar Star" and which was 630 miles in diameter. MacPherson also tells us how comets tend to break up into showers of meteors. They are "not lasting" bodies but "even in the short period of man's life comets have been seen to break up and disappear". Surely that fact coupled with the size of the average nucleus shows us that a comet is in very truth the last state of a planet after it had been broken up, and before its last vestige--the central sun--in its turn is broken into fragments. It is perhaps aside from our main argument, but the likeness between the cellular structure of the living body, the cellular structure of the atom, which is now thought to be a highly complex thing, and the supposed cellular structure of the heavenly bodies has not hitherto been pointed out. But only if our theory be true are the heavens really filled with cellular bodies. If our theory be true, the planet is seen to be a body very like the protoplasmic sell of the living animal or plant, which has its outer envelope and its central nucleus. And we must remember too, that the atom, as modern science views it, is a system of tiny particles which form a sort of envelope around a pivotal point. At all events the analogy is a striking one although we do not wish to push it too far or to deduce anything from it. After all, there is so much direct evidence from every angle to support this theory that we can afford to leave severely alone all mere reasoning from analogy and fantastic comparison.